Fiber, vitamins, minerals, electrolytes, high nutrients, low-calorie, no artificial flavors or colors, natural sugars are part of a heart healthy diet and all easily available in a diet rich in colorful vegetables. If it is hard to get your servings of vegetables per day consider smoothies, chopping into small pieces adding small amounts to every meal you make. Ask yourself are you getting 4 1/2 cups a day of vegetables? Most will say no. Try new vegetables, search the internet for recipes. Start slow and add a little more over time. Make it feel as if when finished feel like you could have done more easily. Begin exercising at this intensity for several sessions before making large increases in your intensity or effort required to be physically active. . Remember the whole goal is to adapt, and by doing so the body is changing how it responds. In the early recovery stage the exercise prescription is very light. Do you know What exercise prescription is best for you? Since exercise should be part of your everyday routine in order to make it a lifelong habit injury avoidance is important to be aware of overuse signs and symptoms, to rest those muscles when needed. Occasionally cardiovascular disease patients develop Peripheral Artery Disease and symptoms can present similarly to overuse. Pain should signal the body to be aware that something is going on. Take some time to evaluate that pain, what happens with it, does it always come on at a certain time or point of the exercise or activity? How long does it take to go away? Can it be avoided while being active by another means for instance switching from walking to biking? Make sure you communicate these findings with your healthcare practitioner as they could be signals of other health conditions related to heart disease and it’s recovery. Some exercise and activity is better than none, so start slowly. Even a warmup is better than no exercise session here is why warming up before strenuous activity helps your heart. Don’t expect results overnight, but do take small steps each day. Move that blood around, push it through the muscles. Make the muscles use the oxygen in the blood more efficiently. Exercise helps the the heart recover and stay strong. You might not notice any big changes—especially in your weight—for a few weeks or even months. It is still good for your heart health! It is not all about weight loss. Forget the scale for a while. In fact many who initially start to exercise following hospitalization are Sedentary at the start and will gain a couple of pounds. It is their muscles getting pumped up, holding and utilizing more blood flow. Generally the focus on how you feel. Symptoms to be alert for include these. Do you make an effort to include plant sterols in your diet? Working in healthcare the frequency of poor decision making when it comes to end of life decisions and choices has made many a good healthcare provider change careers. It becomes an ethical dilemma when patients are coerced into major procedures when the outcome will be poor regardless of the intervention. Many times it is because of poor communication between the patient, their family and the caring physicians. This can largely be prevented through advanced care planning. Effective communication between the patient or legally designated decision-maker and health care professionals ensures decisions are sound and based on the patient’s understanding their medical condition, their prognosis, the benefits and burdens of the life-sustaining treatment and their personal goals for care. The discussion should include what interventions would you agree to, what do you want to avoid? What do you want your family to know. Decisions include CPR, life support, respirators, tube feedings, surgical procedures, pain management, medications, skilled nursing facilities, hospice. How do you choose to spend your final days? At the bottom of this post you will find many wonderful resources to help you in decision making, and communication with family and physicians. advance care planning to keep healthcare centered around patient goals. This progressive and debilitating disease can lead to stroke, heart failure, and Alzheimer’s disease, and can double your risk of death. Afib takes a physical toll, an emotional toll, and a financial toll on those who are living with it—not just the patient, but the family, too. Although atrial fibrillation itself usually isn’t life-threatening, it is a serious medical condition that sometimes requires emergency treatment. It can lead to complications. Here is a short video Do you know what Atrial Fibrillation feels like? Atrial fibrillation (AF) occurs if the heart’s electrical signals don’t travel through the heart in a normal way. Instead, they become very rapid and disorganized. With atrial fibrillation (AFib),the electrical signals of the heart are abnormal. Damage to the heart’s electrical system causes AF. The damage most often is the result of other conditions that affect the health of the heart, such as high blood pressure and coronary heart disease. In AF, the heart’s electrical signals don’t begin in the SA node. Instead, they begin in another part of the atria or in the nearby pulmonary veins. The signals don’t travel normally. They may spread throughout the atria in a rapid, disorganized way. This can cause the atria to fibrillate. The faulty signals flood the AV node with electrical impulses. As a result, the ventricles also begin to beat very fast. However, the AV node can’t send the signals to the ventricles as fast as they arrive. So, even though the ventricles are beating faster than normal, they aren’t beating as fast as the atria. If this happens, blood isn’t pumped into the ventricles as well as it should be. Also, the amount of blood pumped out of the ventricles to the body is based on the random atrial beats. 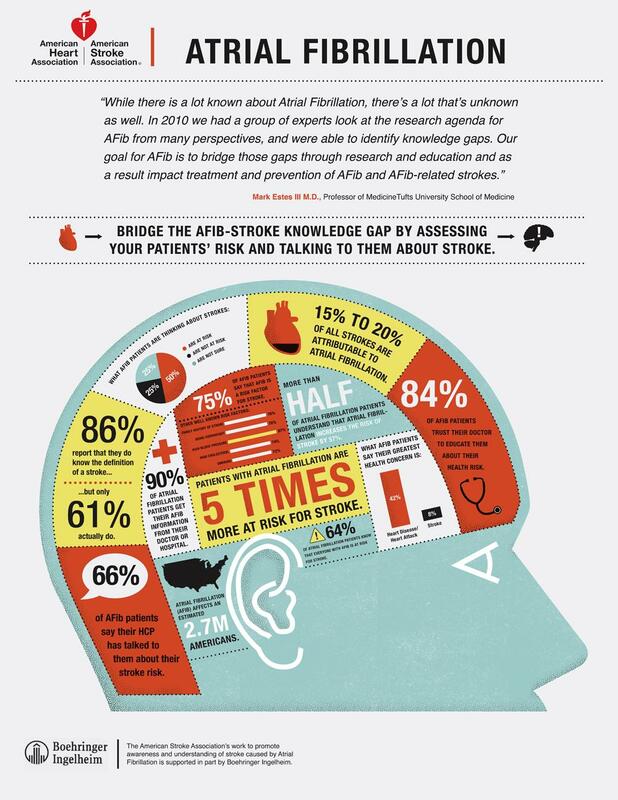 AF may be brief, with symptoms that come and go and end on their own. Or, the condition may be ongoing and require treatment. Sometimes AF is permanent, and medicines or other treatments can’t restore a normal heart rhythm. A good question to ask your healthcare provider is what is the cause of my AFib? AF also is more common in people who are having heart attack or who have just had surgery. The risk of AF increases as you age. Inflammation also is thought to play a role in causing AF. Drinking large amounts of alcohol, especially binge drinking, raises your risk. Even modest amounts of alcohol can trigger AF in some people. Sometimes, the cause of AF is unknown. Cardioversion is done two ways: An electrical procedure, in which your heart is given low-energy shocks to trigger a normal rhythm. You’re temporarily put to sleep before the shocks are given. This type of cardioversion is done in a hospital as an outpatient procedure. “Outpatient” means you can go home after the procedure is done. Do I need to change my eating habits? Should I change my activity level? What else can I do to lower my risk?